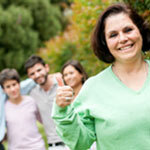 Parents will gain confidence by discovering their parenting principles. Parents will learn to appreciate their parenting strengths, themselves and their children. Parents will compile a toolbox of parenting skills, techniques and resources to use anytime. Considering working with a parent coach?